In a recent poll held on Mozambique Tourism para todos, Mozambique's largest tourism group on social media, Tofo was a run-away leader in the vote for Southern Mozambique's favourite beach. During the course of the voting over 700 votes were cast with Tofo receiving a commanding 164 votes with Bilene in second place with 99 votes. A majority of the beaches are from Inhambane Province with Maputo Province being represented by Ponta do Ouro and Macaneta, and Gaza Province being represented by Bilene, Chidenguele and Xai Xai. There were some participants in the survey who questioned the results complaining that they demonstrated a popularity contest or the beaches with easiest access. Certainly for pure beauty beaches like Pomene and Morrungulo deserve many more votes. What can't be argued is that the Southern Provinces of Maputo, Gaza, and Inhambane are blessed with a wide range of incredible beaches whether your preference is for the busy Ponta do Ouro and Tofo, or the more relaxed beaches like Santa Maria and Chidenguele. And over the last few years access to these beaches has increased meaning that there is no longer any excuse to keep returning to the same beach year after year. You can still vote in the poll. If you have the opportunity make sure you get out and experience those beaches that you haven't made it to yet! Praia do Tofo, or Tofo Beach, has long been a favourite for travellers, especially deep-sea divers and surfers. The coast boasts some of Southern Africa's best diving locations not only for fantastic reefs but it is more famed for the giant sea life below the surface including regular spottings of Whale Sharks and Manta Rays. Indeed even adventurers who don't scuba dive experience regular encounters with these magnificent creatures on Tofo's Ocean Safaris. 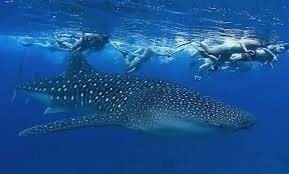 Swimming with whale sharks is often highlighted as one of the highlights of any trip to Mozambique. These activities have brought travellers to Tofo for decades and helped develop its current bohemian elements. Once a destination for mainly backpackers the beach has developed over the years and now boasts quality accommodation like Hotel Tofo Mar which sits right on the beach at the centre of this sweeping bay. The backpacker history has not worn off however with a number of budget accommodations like the legendary Fatima's Place and fantastic eating locations like Long Street with its small bars and restaurants. A trip to Tofo isn't complete without visiting "Dino's", the original bar and restaurant that has been the hub of Tofo activity for over a decade. Bilene, or Praia do Bilene, was known as San Martinho in colonial times. It has a vast calm bay, fantastic for family holidays, and a thriving ocean just outside of the infamous lagoon mouth. There are a host of fantastic lodges both in town, and a lot on the northern edge of the lake in the small village of Nhabanga (see the lovely Serenity Lodge). Joao's Place is located in the main town and is a favourite for families due to it's spacious self-catering houses and also offers some of the best fishing charters in the Bilene area. Another one to look for is Dreams with it's unique rooms and beachfront location. For campers you can't beat Laguna Camp. On the other side of the lagoon Nghungwha Lodge is now setting new standards with its high-quality accommodation, pool area, and restaurant. It's one that you should definitely put on your list. Only a small jump from Maputo it is easy to understand Macaneta's popularity. It was known as Macaneta Island for many years before the small bridge removed the illusion of island life (for years access depended almost entirely on an unreliable ferry that could only carry six vehicles). Not only a beach getaway the Peninsula is becoming a favourite for Maputo conferencing with places like Lugar do Mar setting a high standard. Beaches, fishing, quad-biking, dining, pooling, Macaneta has it all, and also has fantastic horse-riding options like at the unmissable El Paso.